Tomorrow night Tammy will be closer to the man of her dreams than she has ever been and it might be painful for me to watch. 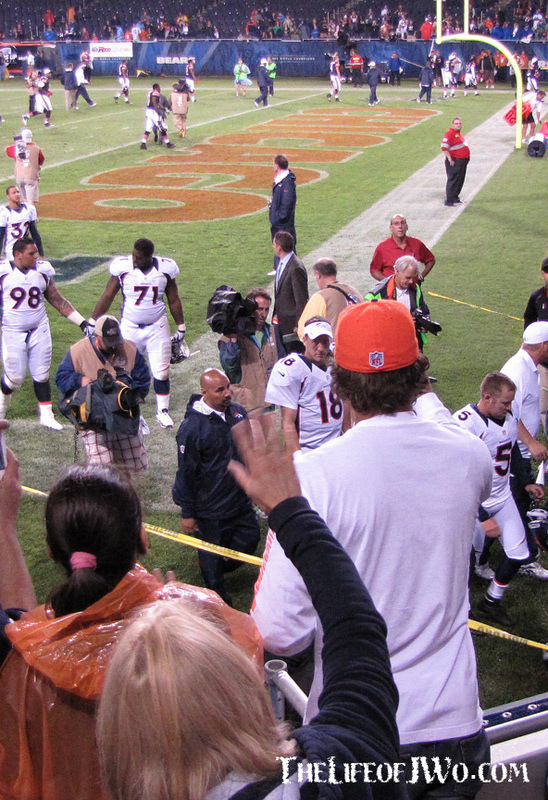 Peyton Manning is coming to town to lead the Denver Broncos against the Chicago Bears and we have had to get tickets. Tammy: How could we NOT go? Really? 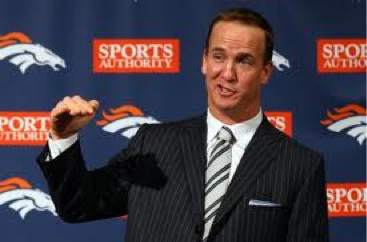 How many times is Peyton Manning gonna be in the same town as me? We HAVE to go. Tammy’s love of all things Peyton has been well documented (here, here and here) but this is going to be the first time she is going to be able to see him live and in person. I’m envisioning something along the lines of her acting like how girls reacted when they saw Elvis or the Beatles for the first time. I’m pretty sure she won’t have the same shrill screams. Instead it’ll be more like a constant screaming of his name. Tammy: Peyton!! 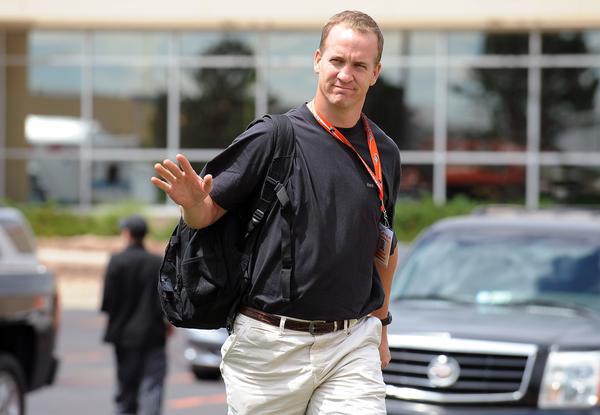 Whoo… Hey Peyton!! Hey Peyton!! How are the twins? Hey Peyton, I like your new house!! Hey Peyton my father-in-law used to call on your grandfather’s store in Philadelphia (Mississippi). Hey Peyton!! It’s been like this for three quarters is she ever gonna stop?!?! Tammy’s shirt, the one with the “big” logo that bothers her. When Peyton went to the Broncos Tammy got ride of almost of all of her Indianapolis Colts clothing. Back in June Tammy went to Denver (here) for her work and, despite her finding where Peyton lived, she didn’t get to actually see him. 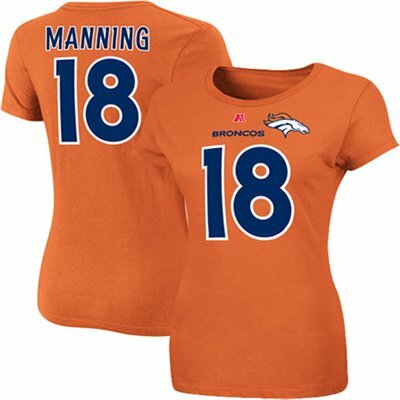 But she DID buy her a new Manning shirt to replace her old Colts one. Tammy: This is the best one they had. I didn’t want that stupid [Broncos] logo on it but this was the shirt with the smallest one. Me: Baby, it’s got to have that logo on it. Tammy: I know, but I don’t want it there. 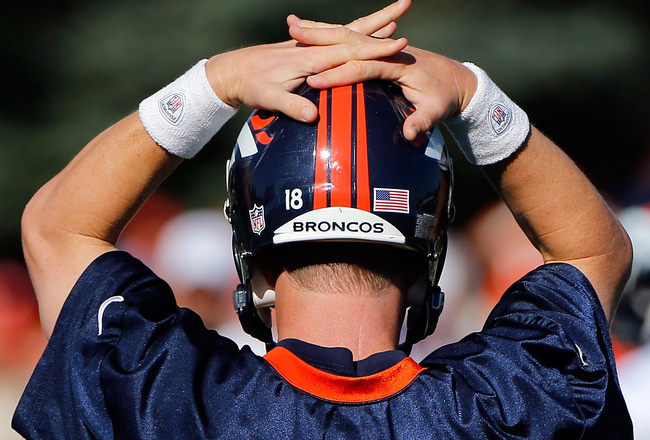 I just want the number 18 and Manning on it. Obviously she’s going to be wearing her Broncos Manning shirt when we go to the game on Thursday night which was something a few of her co-workers couldn’t believe. Tammy: They were all saying how they couldn’t believe I was gonna wear my Manning shirt. But I told them it’ll be alright because it’s tricker. It’s orange and I bet no one will even notice. Let’s hope no one notices because we got our seats from a season ticket owner. Hopefully Tammy’s Manning love won’t get us her kicked out and cause problems for the owners. The fact that Peyton might not even play or will only play for one series doesn’t bother Tammy, but there is one thing she is dreading about seeing her Man(ning). The high tomorrow is only sposed to be 75º, which is PERFECT for me but not so much for Tammy. That combined with there being a 60% chance of rain and 15 MPH winds projected for the 7:30 kickoff has her a little upset. The fact that it’s gonna dip into the 60s before the game is over has her thinking bout breaking out her winter coats. She’s already got her “outfit” pulled together and I’ve got my list of items to bring, binoculars, camera, windbreakers, tickets, etc. I’m just hoping the post-game press conference doesn’t look something like this. Did ya’ll see that one lady that kept yelling at me the entire game? She was wearing an orange Manning shirt and was about this tall. Gallery | This entry was posted in Daily Life and tagged Chicago, daily life, Denver Broncos, Football, humor, Peyton Manning, sports, Tammy. Bookmark the permalink. Awesome post! I am a life long Bronco fan. I am also a Peyton Manning fan. Now that they are one and the same a trip to Denver may be in my future! 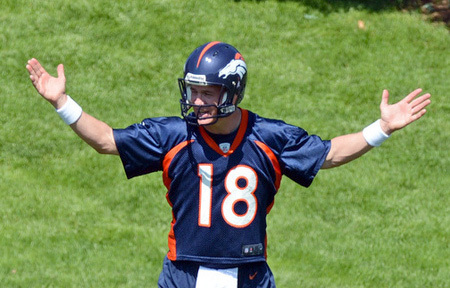 I’m a Tammy fan – but not a Manning fan. I feel for Tammy when it comes to the weather, though. Anything under 70 demands a winter coat, I think. He’s going to pick her right out of the crowd and invite her onto the field…and you’re going to be crying. You saw the one picture where it looks like he spotted her.